30 years in the making, two weeks to be flipped for profit. Two weeks ago, BMW revealed the special edition 30 Jahre M5, marking the super-sedan’s 30th anniversary. Offered in an extremely-limited edition, with just 300 units sold worldwide, this was to become the brand enthusiasts’ ultimate collector’s item. But for some buyers, the chance to make a quick profit is obviously much more appealing. One unit of the car, which BMW sold starting at $138,725, is now being offered on eBay with a listing price of $200,000. The car is being sold in Miami Beach, making it one of the 30 that BMW designated for the US market. 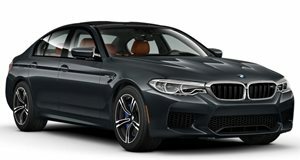 Like the other 30 Jahre M5s, it comes with 600 horsepower and 516 lb-ft of torque underhood, allowing it to dash from 0-62 mph in 3.9 seconds. It is finished in the unique Frozen Dark Silver Metallic paint, fitted with the Competition Package and wears a special plate marking its number within the series. And the owner of this particular unit will have the pleasure of knowing that he paid more than $60,000 over what other drivers have paid for theirs.